Question 1 In what ways do pressure groups and movements exert influence on politics? Answer 1 Pressure groups and movements exert influence in a variety of ways. They try to win public support and sympathy for their goals and activities by carrying out information campaigns, organising meetings, filing petitions etc. They also make use of media. They often organise protest activities like strikes or disrupting government programmes. Workers ‘organisations, employees’ associations etc. often resort to these tactics in order to force the government to take note of their demands. Business groups often employ professional lobbyists or sponsor expensive advertisements. Some persons from pressure groups or movement groups may participate in official bodies and communities that offer advice to the government. Question 2. Describe the forms of relationship between pressure groups and political parties. Direct: Pressure groups are often formed and led by leaders of political parties or act as extended arms of political parties. Most trade unions and students’ organisations in India are either established by, or affiliated to one or the other major political party. Sometimes political parties grow out of movements. For instance, when the Assam movement led by students against the ‘foreigners’ came to an end, it led to the formation of Asom Gana Parishad and the roots of DMK and AIDMK in Tamil Nadu can also be traced to the social reform movements during the 1930s and 1940s. Indirect: In most cases the relationship between parties and interest or movement groups is indirect. They often take positions that are opposed to each other. Yet they are in dialogue and negotiation. They often raise new issues which are taken up by the political parties. Question 3. Explain how the activities of pressure groups are useful in the functioning of a democratic government? 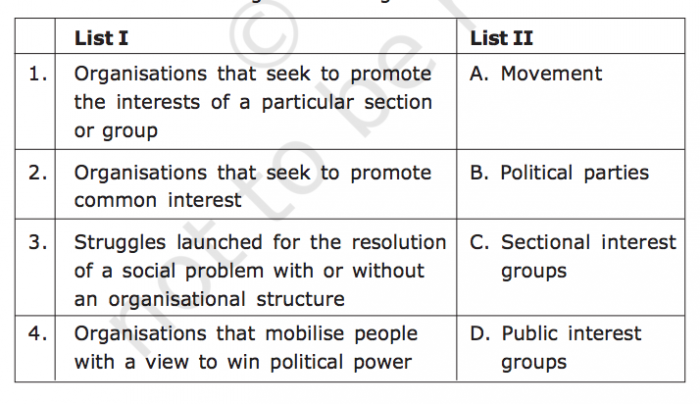 Answer 3 Pressure groups are organisations that attempt to influence government policies. They do not directly control or share political power. These organisations are formed when people with common occupation, interest, aspirations or opinions come together in order to achieve a common objective. Pressure groups are important in the functioning of a democratic government as they provide an opportunity for marginalised people to voice their opinions. In some cases, the government’s opinion might be biased by a small group of rich and powerful people. It is here that pressure groups step in and force the government to make policies which will benefit certain other sections of society as well. For example: Narmada Bachao Andolan, Movement for Right to Information, Antiliquor Movement, Women’s Movement, Environmental Movement. Question 4. What is a pressure group? Give a few examples. Answer 4 A pressure group is an organisation which attempts to influence government policies through protests and demonstrations. Pressure groups are formed when people with similar opinions get together for similar objectives. Examples of pressure groups are FEDECOR and BAMCEF. Question 5. What is the difference between a pressure group and a political party? 1. Pressure group is an organisation formed when people with common occupation, interest, aspirations or opinions come together in order to achieve. 1. A political party is a group of people who come together to contest elections and hold power in the government. 2. Pressure groups are not accountable to the people. 2. Political parties have to face the people in elections and therefore they are accountable. 3. Pressure groups are informal, closed and unorganised part of the political system. 3. Political parties are formal, open and recognised part of the political system. Question 6. Organisations that undertake activities to promote the interests of specific social sections such as workers, employees, teachers, and lawyers are called ……… groups. Question 7. Which among the following is the special feature that distinguishes a pressure group from a political party? (a) Parties take political stances, while pressure groups do not bother about political issues. (b) Pressure groups are confined to a few people, while parties involve larger number of people. (c) Pressure groups do not seek to get into power, while political parties do. (d) Pressure groups do not seek to mobilise people, while parties do. Answer 7 (c) Pressure groups do not seek to get into power, while political parties do. Question 10. Consider the following statements about pressure groups and parties. A. Pressure groups are the organised expression of the interests and views of specific social sections. B. Pressure groups take positions on political issues. C. All pressure groups are political parties. Question 11. Mewat is one of the most backward areas in Haryana. It used to be a part of two districts, Gurgaon and Faridabad. The people of Mewat felt that the area will get better attention if it were to become a separate district. But political parties were indifferent to this sentiment. The demand for a separate district was raised by Mewat Educational and Social Organisation and Mewat Saksharta Samiti in 1996. Later, Mewat Vikas Sabha was founded in 2000 and carried out a series of public awareness campaigns. This forced both the major parties, Congress and the Indian National Lok Dal, to announce their support for the new district before the assembly elections held in February 2005. The new district came into existence in July 2005. In this example what is the relationship that you observe among movement, political parties and the government? Can you think of an example that shows a relationship different from this one? Answer 11 From the example of Mewat, we can conclude that movements take up issues which are sometimes ignored by political parties and try to influence them. The sixyear long Assam movement (1979-1985), led by the All Assam Students’ Union (AASU), was aimed against the infiltration of foreigners from Bangladesh into Assam. At the end of this movement, the State Assembly was dissolved, the government was dismissed, and fresh elections were held. The Asom Gana Parishad, formed out of the AASU, contested and won the elections, forming the Government of Assam. In this example, we see a political party being formed out of a pressure group, which ultimately formed the government.